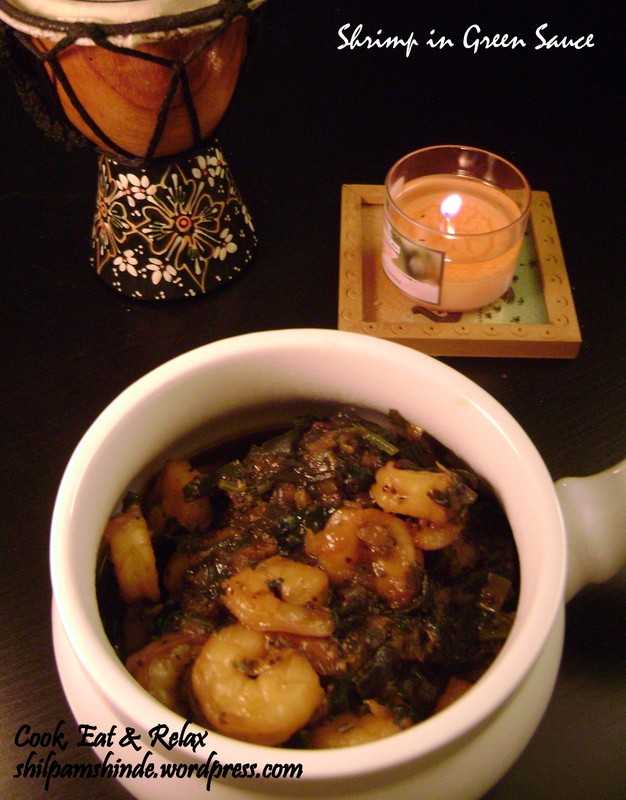 So as promised in my post a few days back, here is the second recipe that I came up with for the shrimp. I guess there are some things from your roots you are rarely able to get away from. Like my love for black pepper. My family is originally from a town called Tellicherry in Kerala. And it’s famous for its black pepper. I never realized that the black pepper from back home was sold at a premium here in the US. You find Tellicherry black pepper in gourmet aisles. And to think of it, my grandma’s home in Tellicherry had a pepper tree that I barely remember. Well I do remember it but I guess it’s only when you can no more see it every summer vacation that you miss it. I really miss those month-long summer vacations in Kerala. My cousins and I have some pretty awesome memories from those long past days. Anyways to get back to my shrimp recipe, I love pepper and I love using it in most of my recipes rather than chilli powder. I love the spicy hotness black pepper leaves behind in your throat. So if you are not one who loves black pepper, just hold back on the amount you put in. But you may miss out on the essential taste of this dish if you put too less of it. I used sweet sake and pepper as two main ingredients because the final taste that this dish leaves behind is the sweetness of the sake and the hotness of the black pepper. And to add to it, it a pretty quick to make recipe. It took me about half hour to make it, specially since I had deveined, tail off shrimp at home. I used about 30-40 medium-sized shrimp and it served about 2-3 persons for a very filling meal. Heat the oil in a wide bottomed sauce pan. Once hot, add the mustard seeds. Once the seeds start to sputter add the curry leaves and green chilli and stir for a few seconds. Next add the white part of the green onions and stir fry for a couple of minutes, till it softens. Then add the green part of the green onions and stir for a few minutes till it has softened. Next add the garlic paste and fry till the raw smell of garlic and gone. This would take a couple of minutes at the most. Now add the soya sauce, the spicy schezuan stir fry sauce (if using) and the sweet sake and bring to a simmer. Next add the shrimp to this sauce and let it cook. If you want a dry dish without any gravy, do not add the vegetable stock / water. But if you would like a dish with more gravy in it, add the vegetable stock/water depending on how much sauce you would like. 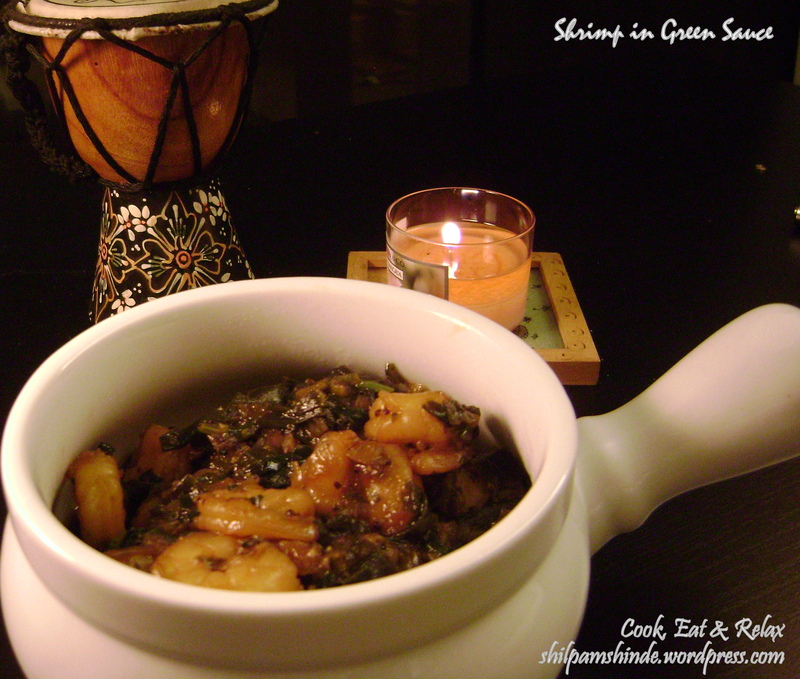 Once the shrimp has almost cooked, add the black pepper and the coriander / cilantro leaves and stir it. Let cook for a couple of minutes and take it off the heat. I served this with some bread, but you can serve it as an appetizer if you reduce the gravy or with rice if you increase the sauce by adding more of the vegetable stock / water. I hope you enjoy this dish as much as Amit and I did. I have made it a couple of times now and this is one recipe that’s quick and easy to make. And I still have the third of the trilogy to post, which I will very soon. And I just realized that this post is right on time for St. Patrick’s day and what a coincidence that the dish is Shrimp in GREEN sauce!!! So Happy St. Patrick’s day to everyone. Have fun, be safe and don’t drink and drive! This entry was posted in Main Course and tagged black pepper, Cilantro, corinader, green onion, green sauce, main course, Prawns, quick and easy, Shrimp, shrimp in green sauce, tarragon. Bookmark the permalink.